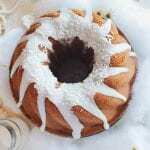 Preheat the oven to 180 degrees Celsius and grease a round bundt tin. Using an electric whisk, cream the butter and sugar for 1-2 minutes until pale. Next add the eggs, one at a time until they are all combined into the mixture. Add the vanilla and almond extract and continue mixing. In a separate bowl mix the dry ingredients (flour, baking powder, bicarbonate of soda, and salt) and measure out the milk. Add the dry ingredients and milk alternately, starting and ending with the dry ingredients. Once all is combined add the coconut and mix for the last time. You will be left with a thick gritty batter. Bake for 45-55 minutes until the top is golden brown. Remove from the oven and cool completely before removing from the baking dish. Mix the icing sugar and water in a bowl and drizzle over the top of the cake. Sprinkle with coconut and let the icing set before serving.